Thus far we’ve talked about three ways of representing three dimensions on a two-dimensional surface: overlapping shapes, diminishing size, and atmospheric perspective. These are all great for still life and landscapes, even figure drawings. But what if you want to do some urban sketching down at the corner of Main and Maple? How will you render those buildings? Perspective! Perspective seems to be a word that causes many an artist to quake in their boots. It’s really not difficult. But first, a little history. While various cultures reportedly tried different methods of perspective, the rules we now use are now credited to two 15th century Italian Architects, Filippo Brunelleschi and Leone Alberti. Brunelleschi discovered that imaginary lines can be drawn to show how objects within a parallel plane diminish toward a horizon line, ending at a vanishing point. Using these converging lines, objects can actually be measured in proper geometric proportion to one another. He used this theory to create two large panels depicting very accurate views of Florence. Alberti wrote “Della Peintura (On Painting), a book that documents the process. Using these principles, one can draw any scene precisely. Why do we need perspective? If you consider the room you’re sitting in, your brain tells you that the walls are square and straight, the ceiling is flat or perhaps sloped, and the floor is level and even. This knowledge challenges what you see. 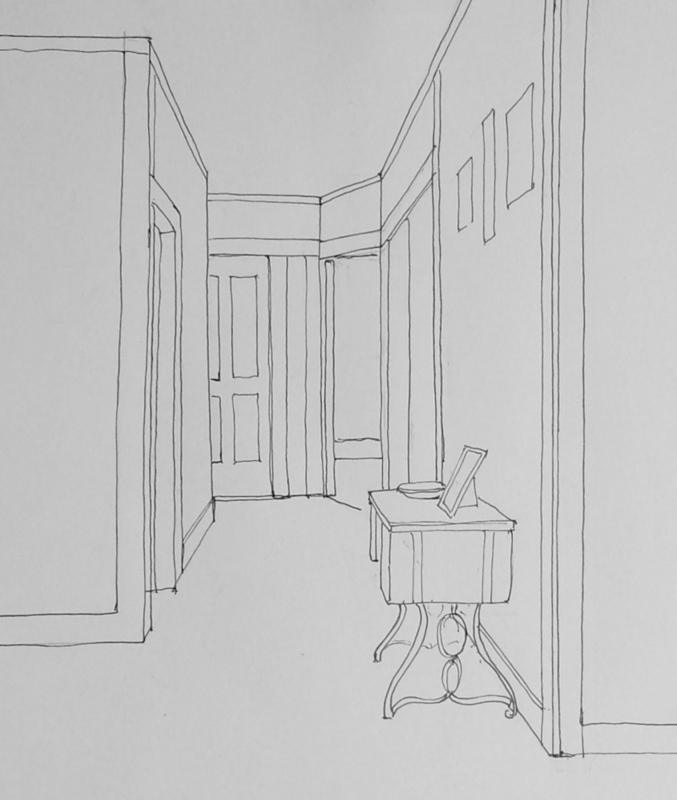 To draw the room “right” you have to angle the floor up and the ceiling down, the walls stay vertical, but all those right angles where the walls intersect must change on your paper. Generally our brain interferes and tells us, “that can’t possibly be right!” But it is. By taking the time to learn the principles of perspective we learn to see even more clearly. Remember, drawing is seeing. Next Do you know where your Horizon Line is?